If only in 1959 Bhutan had not refused the flow of Tibetan refugees – in terms of physical and spiritual DNA their brothers and sisters – but had permitted the Dalai Lama and his entourage to stay on its territory, Bhutan would have long since been serious competition for the Vatican. What concerns me here is not the despotic rulers of Bhutan, though one can only willfully leave their regime unmentioned. Nor am I concerned here with indicating how the Bhutanese royalty has for decades been sowing fear because the family clique itself is afraid of being crushed by the still popular Maoism which emerged during the eighties in adjacent areas like Asam, Bihar, Bangladesh and indeed ended the monarchy in Nepal. It is perhaps ironic that communism is mainly so popular because the poverty at home is increasingly in stark contrast with neighbouring capitalistic ‘economic miracles’ such as China, Thailand, Singapore or South Korea. My concern here is the decadence of in particular the western elite, prominent figures, politicians and wealthy supporters who cherish a small dictatorial state somewhere deep in the Himalayas as a magical-mystical wonderland and favouring it, openly or surreptitiously, in many ways and without any comment. Although Bhutan had open borders only since the seventies, the international craving for - wherever in the world - a bright, pure, pristine, unsullied, untouched, pure, clean Shangri La has its own prehistory. 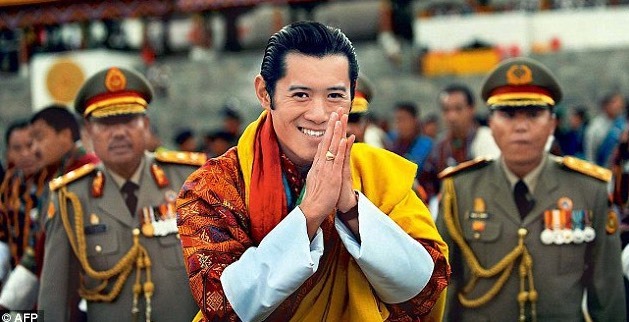 It took a long time, some four or five years, before the tragedy in Bhutan got any international attention. Somewhere around 1977. Not widely spread but evident enough. 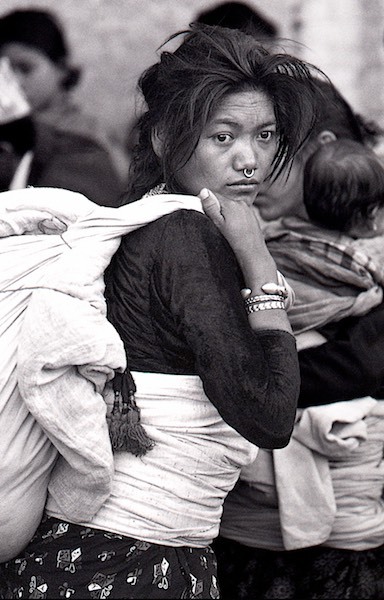 Reports were published (see at end) on how the Bhutanese government with military force expelled about a fifth of its population – some 110,000 men, women and children – out of the country. 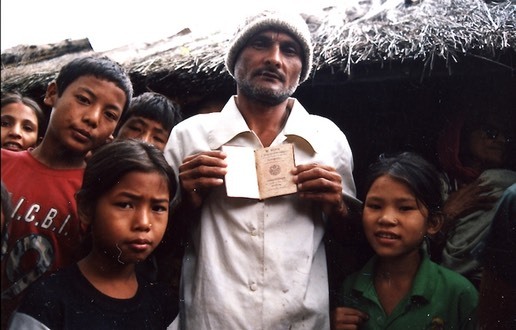 This portion of the people 'did not belong’, according to the official statement, even though they had inhabited the country already for three or four generations and most of them even possessed official Bhutanese identity papers. That they were of a different persuasion, was a windfall. Propaganda likes working with slogans and exclamation marks – the king: one country, one people! – and labels – the government: they are different, they are Nepalese! – and consequently downplayed the expulsion as an inevitable conflict between Buddhists and Hindus. In terms of global legislation their action is called ethnic cleansing. And a government that deports a part of its population implements a fascist policy. Popular as the small ideal state is, however, soon enough little was heard of it internationally. Apart from an occasional short report by Amnesty International or the UNHCR. 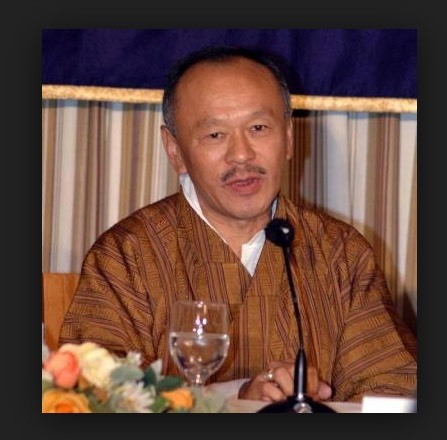 ‘All myth,’ prime minister Jigmi Thinley invariably lies through his teeth – if anyone enquires at all. Most journalists and makers of documentaries or travel programmes condone the ethnic cleansing with soothing epithets by putting the blame on the deportees or by keeping it completely out of the picture. When visiting Kathmandu, I often heard and read about the increase of refugee camps in the far west of Nepal, an unpopular piece of hot jungle with plenty of space. However, Nepal had its own problems at the time - as it still has. Well, one can always compare with worse or better – comparison can therefore never be an argument. 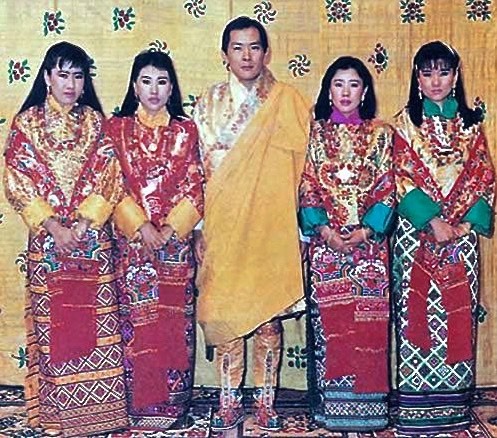 To secure the power (throne), King Jigme Wangchuk simultaneously married with all four daughters of the country’s second most powerful family (see House of Cards link below). Later on researcher Professor Michael Hut (1) from the University of London was addressed with similar accusations when he described the Bhutanese policy as Royal Realpolitik – I happen to be in good company. Even a year ago a documentary maker of the Dutch Buddhist Broadcasting Company – a very regular visitor to Bhutan – held a diatribe against me, stating that all stories were manipulated nonsense – a conspiracy against Bhutan, no less – and that most exiled 'Nepalese' were only after personal gain or trying to make it to a western country, and other nasty things. 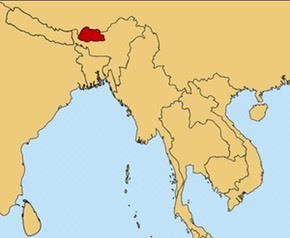 The fact that Bhutanese royalty caused thousands of deported peasant families to have been trapped in seven camps for twenty years did not fit the image of the small ideal Buddhist state in the Himalayas that was worldwide cherished, supported or marketed (by travel agencies, all-in meditation or yoga courses, etcetera). The Bhutanese Ministry fully exploits this ‘uniqueness’: one cannot just visit the country. To get a visa, the applicant must realize he belongs to the chosen ones. Divide and conquer. Already in the seventies a visa implied a compulsory expenditure of $ 200, - per day. With support of donor countries, about 90% of the deportees have been transferred to Western countries in recent years, mainly to the United States. I vividly remember a small striking picture in Newsweek of a woman – dressed like the woman here at the right – standing totally dazed on a traffic island in the heart of Manhattan. Under pressure from Washington’s geopolitics, Dutch politicians had about four thousand Bhutanese exiles flown in as well. Only in Nepalese newspapers did I read about it at the time. In the year 2017 the largely abandoned camps in the hot jungle still count some 12,000 inhabitants. They only want to return to Bhutan, or have no other option – no matter how difficult this would turn out to be because of predictable discrimination. 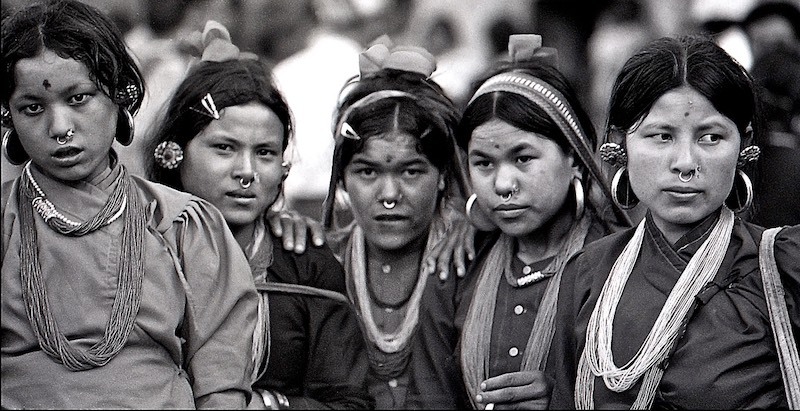 They have family still living in Bhutan or they may be too old to emigrate to yet another culture, and so on. The fewer residents, the spookier such a camp becomes: schools close, sanitation breaks down, aid agencies leave, there is less food, and so on. Even the return of the last 12,000 people does not find favour with the royal realpolitik. This is to be expected from a dictatorial regime that prescribes traditional clothing for its inhabitants and even blocked state television till 1999 – for example. They prefer enlisting a small army of PR people to taunt unwelcome (scientific) research or to turn wikipedia pages of the royal family into true hagiographies – for example. In addition, the Bhutanese Ministry of Information regularly manages to target the ideal (usually Western) public figures, politicians, officials and journalists to carry out their propaganda for them. To give an example, just before last Christmas Chandra Sapkota from India (‘working for the UN but writes here in a personal capacity’) proposed his ‘viable solution’ in the Kathmandu Post, in which he admonishes the Nepalese government to integrate the 12,000 camp residents, for otherwise it could have far-reaching consequences for Nepal's global image – a ‘viable solution’ topped with a dollop of threat… to a country that has long been a safe haven to many refugees … he’s got guts ... or does he want to get a visa for Bhutan without the obligatory daily spending of hundreds of dollars? 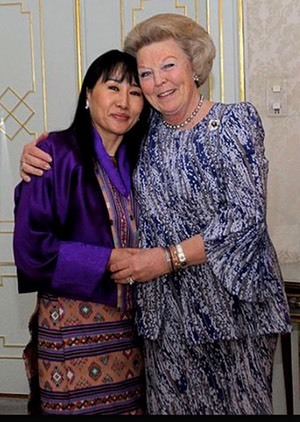 For quite some time Bhutan was the prime recipient of per capita most development funds from Dutch ministers like Eegje Schoo. But the utlimate thing, of course, is to acquire consulship. The capital Thimpu itself only counts six consulates (Thailand, Belgium, Netherlands, Sweden, India and the UK), but conversely Bhutan has more than twenty worldwide, not counting the numerous honorary consuls. Such an unexpected title on a business card always impresses – like a luxury coffee table book that has to suggest knowledge. Why the Western world uncritically raves about Bhutan, that's what concerns me here. It can’t be just because the small Buddhist mountain state uses the term Gross National Happiness, can it? 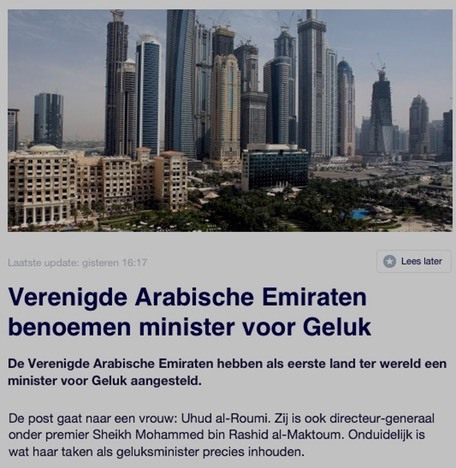 Within in this PR term itself – which the Dutch Political party GroenLinks even adopted for a while – ethnic cleansing is lurking. 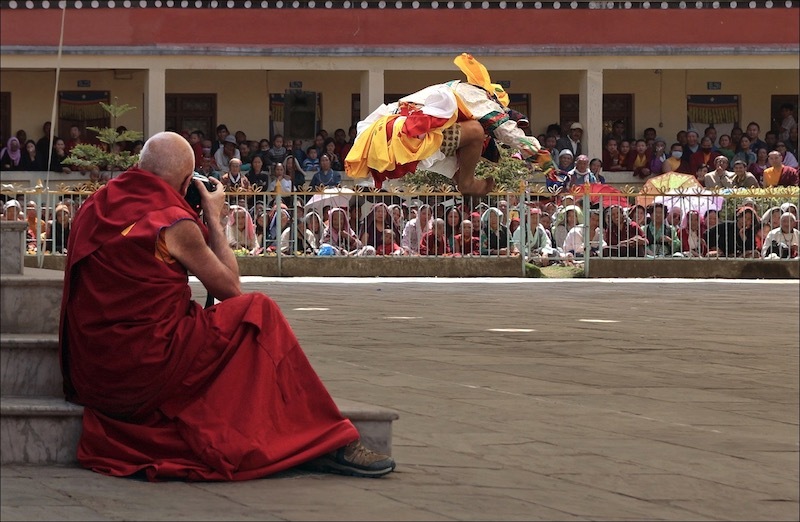 After all, any self-respecting Buddhist will go for Gross International Happiness. Of course, this tells a tale about rulers in general. Politics is never about religion or philosophy of life, but everywhere and always about money, power and 'the drug of the day’ as someone recently told me: ’security'. What the Ted Talk by the Prime Minister of Bhutan mainly demonstrates is how the ruling ethnic clique in Bhutan started to believe in the excellence of its own principality. Actually, the rest of the world should take Bhutan as an example to reduce CO2 emissions to zero as they did. It earns him prolonged applause. If tourism and the export of hydropower – built, financed and purchased by big brother India – are your main sources of income and all you needed for infrastructure was ordered abroad ... well, if in that case CO2 still isn’t down to zero, then your snowy woods must be on fire. Of course, as the Western world-and-me, are living in glass houses, we should not throw stones at Asian countries. When we move all our factories to China for reasons of cheap labour and lack of environmental legislation and then in disbelief or abhorrence watch on television the solid smog in Beijing, you are believing your own capitalist propaganda and pretending we do not all share the same atmosphere on this planet. (In Poland, meanwhile, things have gotten just as bad, I read in today’s papers, it is getting closer). What I want to point out is only how worldwide the ethnic cleansing is ignored or even flatly denied, while the small Buddhist mountain state continues to be stubbornly venerated. It is close to an international political charade. 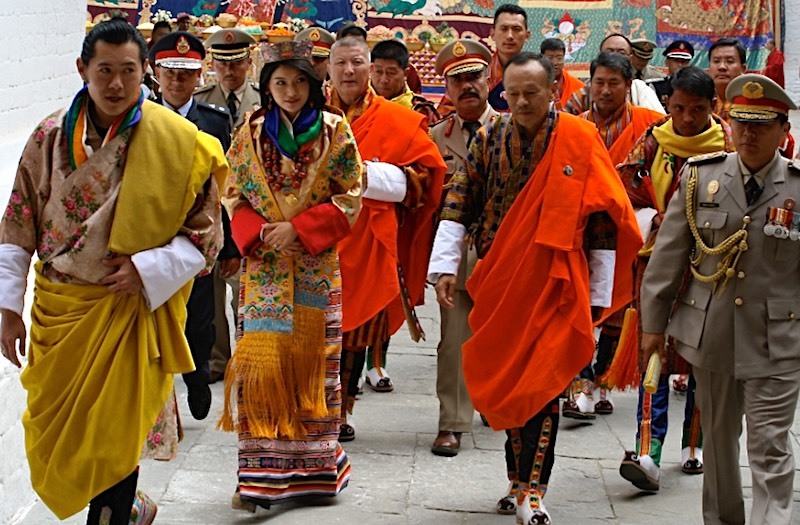 With less than 700,000 inhabitants, Bhutan is a so-called 'client state’ that is entirely under the control of India for its economy, security and foreign relations – the ‘big brother’ who, in turn, is often made to look troublesome, dirty and overpopulated by Bhutan-adepts. Both Nepal and Bhutan are entirely landlocked by India (and the Himalayas). The two countries are bound hand and foot to the superpower, in a way their independence seems only to be only tolerated (see: Nepal 2015). Prior to each major decision their politicians fly to New Delhi for a dental visit or an annual health check. By the way, probably even they themselves will at times wonder why India has been perpetuating this situation since independence in 1947, while its dependence on and investment in their hydropower continue to be gigantic – but this aside. As in the past century, certain wealthy circles are looking for some pleasant meaningfulness amidst their abundance of luxury and time. All sorrow, inherent to existence, gnaws from somewhere far away but is carefully muffled with yet more of everything. That the western world lost religion – not the ecclesiastical meddlesomeness, nor the desire for magic and mysticism, but the essential truth-seeking – at times becomes painfully evident, as for example in sudden mega-selling booklets like 'Eat Pray Love'. Most of Bali, Burma or Bhutan travelers have no idea of what Buddhism implies other than a relaxing atmosphere with a statuette, a bell, a stick of incense and firmly closed eyes. With personal growth as a goal. Growth for the sake of growth according to Edward Abbey is the ideology of a cancer cell. With a bit of an open mind one can read in this slogan as the difference between ‘working on yourself’ (buddhahood aim) and ‘doing volunteers work’ (bodhisattvahood aim). Or as Paul van der Velde noted in Tattoo of the Soul: religion is also a continuous training in empathy. Finally, who built the camps without permission on Nepali territory and for decades blocked the way for every fugitive trying to go back home? As a client state of India, Bhutan could not execute the deportation without close consultation with the government in New Delhi. Possibly the plan even originated from the controversial Indian RAM-security service (which in 1975 brought down the independence of the neighbouring principality of Sikkim; only in 2003 China did annull its claim and acknowledge the state asa part of India). The geopolitical background can be further distilled from the fact that the US without much ado had tens of thousands of refugees flown over to America. 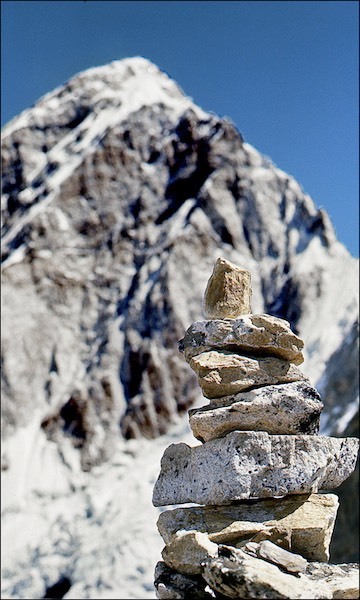 Unlike the continuous Himalayas range in Nepal, Bhutan is a sensitive border area with China due to relatively low mountain passes. Even the British colonial army positioned itself in Sikkim and Bhutan but not in Nepal. Thanks to the Indian policy of apartheid, Bhutan changed over time to a buddhist free-state, i.e. free of Indians and Nepalese. The principality mainly expanded the isolated idyll: every resident who was allowed to stay, consequently feels privileged and shouts the refugee drama down with sweet talk about national happiness etcetera - and for perfectly self centered reasons the international jet warmly participates. – So, not off to Bhutan then? So, not off to Bhutan then? Please, do go. Interaction with people from outside is always needed everywhere. The behaviour and reactions of tourists searching for meaningfulness possibly make locals think, if only about what not to do. All the more so if visitors wonderingly address affairs that are hard to understand or to tolerate. 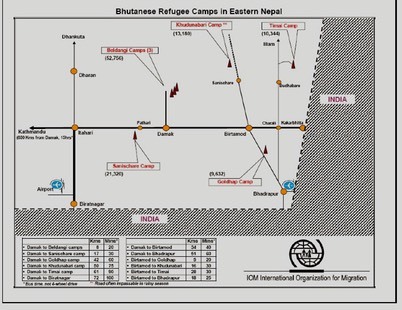 As, for example, the inhumane Bhutanese regime still keeps 12,000 deportees trapped in Nepalese camps. As if real happiness can exist without compassion. Not the idealized but the actual quality of a society, here or in the Himalayas, can be deduced from the way the weak are treated. 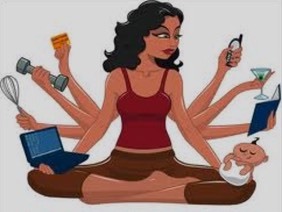 ‘I'm only on vacation.’ With a buddhist orientation, right? May I conclude by quoting a piece of conversation for meditation during the long flight? Margaret Mead: Did you bomb those little girls in Birmingham? 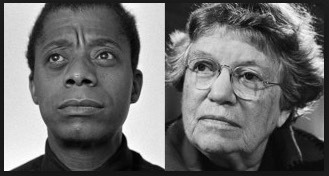 James Baldwin: I’m responsible for it. I didn’t stop it. Mead: Why are you responsible? Didn’t you try to stop it? Hadn’t you been working? Baldwin: It doesn’t make any difference what one’s tried. Mead: Of course it makes a difference what one’s tried. Baldwin: No, no, no. We are all responsible. Mead: Look, you are not responsible. Baldwin: That blood is also on my hands. Baldwin: Because I didn’t stop it. Mead: Is the blood of somebody who is dying in Burma today on your hands? Mead: And I will not accept it. I will not. Baldwin: “For whom the bell tolls.” … It means everybody’s suffering is mine. Mead: Everybody’s suffering is mine but not everybody’s murdering, and that is a very different point. I would accept everybody’s suffering. I do not distinguish for one moment whether my child is in danger or a child in Central Asia. But I will not accept meaning searching for what other people do because I happen to belong to that nation or that race or that religion. I do not believe in guilt by association. 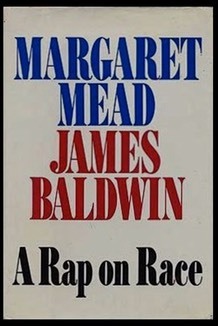 Baldwin: But, Margaret, I have to accept it. I have to accept it because I am a black man in the world and I am not only in America… I have a green passport and I am an American citizen, and the crimes of this Republic, whether or not I am guilty of them, I am responsible for. Mead: But you see, I think there is a difference. I am glad I am an American because I think we can do more harm than any other country on this earth at the moment, so I would rather be inside the country that could do the most harm. Baldwin: In the eye of the hurricane. Mead: In the eye of the hurricane, because I think I may be able to do more good there. We are responsible for that. That we are responsible for those unborn children, black, white, yellow, red-green, as the Seventh-Day Adventists say — all of them. We agree completely on that. Now, is it necessary at this moment in history … for someone who is black to take a different stance in relation to the past although we take the same stance in relation to the future? Now it may be. You see, the question I was raising earlier is that maybe in order to act one has to take a different stance. Baldwin: … Now, a thousand years from now it will not matter; that is perfectly true. A thousand years ago it was worse; that is perfectly true. I am not responsible for that. I am responsible for now.